Spinal Stenosis or narrowing of the spinal cord canal is a condition that affects many adults after the age of 50. This occurs when the spinal canal, containing the nerve roots and spinal cord becomes constricted or compressed usually by bone spurs or disc bulges. This can lead to compression of the spinal cord or spinal nerves resulting in cramping, pain or numbness in the back, legs, and or feet. People suffering from Spinal Stenosis may have trouble walking any significant distance, and usually must sit or lean forward over a grocery cart, countertop or assistive device such as a walker in order to relieve the pain. The pain, numbness and tingling is usually equally down both legs. A general rule of thumb is that if the pain is down one leg and hurts worse with sitting or leaning forward it is typically related to a disc herniation or bulge. If a person has pain down both legs and is worse when walking or standing then Spinal Stenosis should be suspected. Spinal stenosis is usually caused by progressive degenerative changes in the spine. This can occur from the narrowing of space around the spinal cord due to bony overgrowth (bone spurs) from arthritis, combined with thickening or calcification of one or more ligaments in the back. Stenosis can also be caused by a bulge or herniation of the intervertebral discs. This must be differentiated from the stenosis caused by the bony overgrowth that can occur on the vertebral bodies, or facet joints. Spinal decompression therapy may not be appropriate in moderate to severe cases of spinal stenosis with many spurs and thickened ligaments. On the other hand, if the stenosis of the central canal is primarily from bulging discs, or herniated discs, then non-surgical spinal decompression may be very successful. A consultation and review of your MRI should determine whether surgery or Spinal Decompression is going to be your best alternative. Who is at risk of developing Spinal Stenosis? 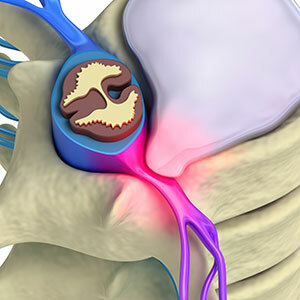 Typically, spinal stenosis is treated with conservative non-surgical therapies. One important therapy is exercise. Keeping the muscles of the hip, back, and legs stretched and strengthened allows for improved stability and will improve walking. Medications such as nonsteroidal anti-inflammatories (NSAIDs) also may be appropriate and helpful in pain relief. Cortisone injections into the area around the spinal cord, may provide temporary relief to people suffering from this disorder however, steroid shots do come with risks. Under severe and rare circumstances, surgery to correct this disorder may be appropriate. 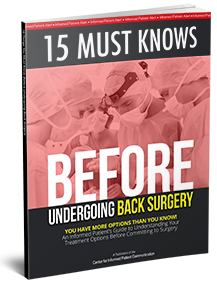 A popular surgery is a laminectomy where they remove the lamina of the vertebra and remove the build-up of bone spurs or increased bone mass in the spinal canal. This can free up space for the nerves and the spinal cord. However, the risks versus rewards should always be assessed and all conservative options should be exhausted first. If Spinal Stenosis is caused or exacerbated by a herniated or bulging disc then Spinal Decompression may be very effective. 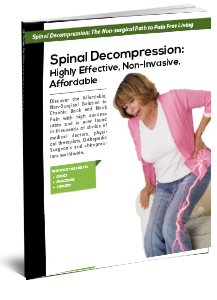 Spinal Decompression creates a negative pressure inside of the discs which helps draw in herniations and bulges. Once these are drawn in the pressure is taken off of the nerves and the pain, numbness and tingling will subside. Consult your physician to determine which therapy will benefit your diagnosis the most. Call Us Today to Schedule YOUR Consultation! We treat low back pain, neck pain, sciatica, herniated discs, degenerative or bulging discs, or spinal stenosis with non surgical spinal decompression. Learn more about this safe, comfortable, and affordable low back and neck pain treatment offered by Pain Relief Centers of Arizona in Ajo, Apache Junction, Avondale, Benson, Bisbee, Buckeye, Bullhead City, Camp Verde, Carefree, Casa Grande, Cave Creek, Chandler, Chino Valley, Coolidge, Eagar, East Fork, Elgin, El Mirage, Eloy, Flagstaff, Florence, Fountain Hills, Gila Bend, Glendale, Globe, Goodyear, Green Valley, Guadalupe, Heber-Overgaard, Holbrook, Jerome, Kayenta, Kearny, Kingman, Lake Havasu City, Lake Montezuma, Litchfield Park, McNary, Maricopa, Mesa, Miami, Mohave Valley, Nogales, Page, Paradise Valley, Payson, Peoria, Phoenix, Pima, Pinetop-Lakeside, Prescott Valley, Quartzsite, Queen Creek, Rock Point, Scottsdale, Sedona, Show Low, Sierra Vista, Snowflake, Steamboat, Strawberry, Sun City, Sun City West, Sun Lakes, Superior, Surprise, Tempe, Thatcher, Tolleson, Tuba City, Tucson, Winslow, Yarnell, Young, Youngtown, Yuma, and Gilbert, Arizona; read testimonials and spinal decompression reviews from many satisfied patients.